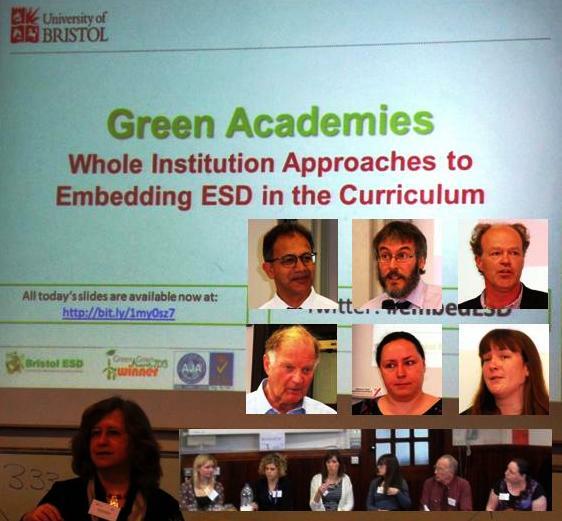 ‘Different disciplines talk about sustainability in different languages,’ said Chris Willmore (Academic Lead, Education for Sustainable Development ESD at Bristol University) at a workshop on ‘Green academies: whole institution approaches to embedding education for sustainable development (ESD) in the curriculum’ held at the university on 12 May 2014. Hosted as part of the Workshop and Seminar Series 2013/2014 of the Higher Education Academy (HEA), the workshop mainly focused on whole institutional approaches to ESD in the curriculum, especially on the role of students as agents of change. The Bristol Model of student intern driven curriculum change has been instrumental in the university’s developments, integrating students, academia and estates at the core of ESD. The day began with a welcome from Peter D’Sena, representing the HEA. Highlighting the HEA’s ESD strategic aim, namely, to make a leading contribution to evidence-informed development of ESD policy and practice across the higher education sector, he briefly presented overview of the HEA Green Academy programme, which focuses on institutional change for sustainable development, helping universities to achieve sustainability in the curriculum. Each session included an introduction, leading to small group work, using a sustainability café approach. Speaking on ‘Institutional Approaches and Disciplinary Language’, Chris Willmore revealed that, at her university, most courses already contained sustainability elements although the respective academics did not specifically referred to these as ‘sustainability’. She also emphasised that sustainability should be fun and should not be a guilt trip. Sharing ‘Lessons from ISO14001 Accreditation’, Martin Wiles (Head of Sustainability, Bristol University) stated that ISO looks at processes around ESD, not at ESD itself, and recommended it for advancing ESD in an institution. Aisling Tierney (ESD Coordinator, Bristol University) delivered two presentations. Firstly, on ‘Developing Mappings of Student Experience’ and then on ‘Linking Formal and Informal Approaches’, briefly outlining four key projects, namely Bristol PLuS, Student Hubs, Farmer’s Market and Student’s Union. Mirroring the Bristol Model’s co-leadership element, the workshop was led by ESD ex-Student Interns Hannah Tweddell (University of Bristol Union) and Aisling Tierney.